The following pattern is my original design. I have seen many variations of patterns using the ch-8 lp. 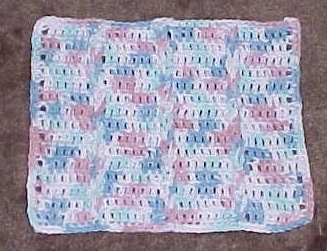 I was first taught this type of stitch by my Aunt Betty Lou while we sat with my Grandmother in the hospital in 1993. Betty Lou did this a bit different though, she chained 10 instead of 8 and when she joined each loop she didn't have me twist it first. This gives a little bit different look as I have tried it both ways. Please only copy or print this pattern for personal use. ROW 1: Chain 58, dc in 4th ch from hk, dc in next 6 chs. * Ch 8 (each time you ch 8 it counts as a ch-8 lp) , sk next 8 chs, dc in next 8 chs. Repeat from * twice. Ch 3, turn. ROW 2: * Dc in each of next 8 dc, ch 8, sk next 8 chs on previous row. Repeat from * across and dc in each of last 8 dc. Ch 3, turn. ROWS 3-15: Repeat Row 2. NOTE: At the end of ROW 15, ch 1 instead of 3, then turn. DO NOT FASTEN OFF YET. REFER TO FIGURE 1 TO SEE WHAT PROJECT SHOULD LOOK LIKE NOW. Working vertically from bottom to top, fold first ch-8 lp clockwise forming a loop. With a crochet hook or your fingers, draw next ch-8 lp through, twisting clockwise. Continue working in this manner through to the last row. Secure last loop with bobby pin or clothes pin. Repeat this procedure on each row of ch-8 lps. Working back across ROW 15, sc in each of next 7 dc, * sk next dc, insert hook in the next ch 8 lp, back up and sc in the dc just skipped catching the ch-8 lp when you make the stitch. Insert hk in the ch 8 lps of Row 14 & 15 and work a sc around both lps. Insert hk in the ch 8 lp of ROW 15 again to complete a sc in the next dc (to the left of the ch 8 lp) Sc in next 6 dc. Repeat from * across ending the row by placing a sc in each of the next 6 dc and placing 3 sc in the last dc [corner made]. Working down the side of Rows 1-15 place a sc around the post of each dc and in the sp where each dc joins another (this evenly spaces the scs down the side). Making sure to do 3 sc in the corner. Working across the bottom, sc in each st, making sure to place 1 sc in the first and last ch of each ch-8 lp, 3 sc in the corner. Working back up the other side place a sc around the post of each dc and in the sp where each dc joins another (this evenly spaces the scs down the side). Making sure to do 2 more sc in the same st as your first sc. Join with sl st. REFER TO FIGURE 2 FOR FINISHED PROJECT. 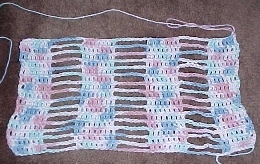 NOTE: You can also use this same pattern to make an afghan. It can be worked in multiples of 8 + 2. I recommend the beginning chain to be 202 for a descent width. Then just keep adding rows to achieve the length you want.